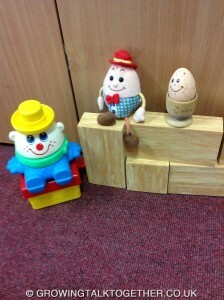 Simple Easter Holiday activities with Humpty Dumpty to engage and develop Attention, Listening & Language Learning ! Much more than just a Nursery Rhyme! 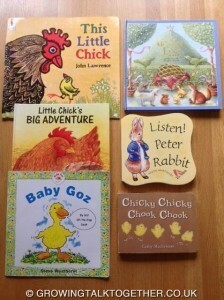 Let you children listen to the rhyme and when they are familiar with it let them fill in the missing words ! 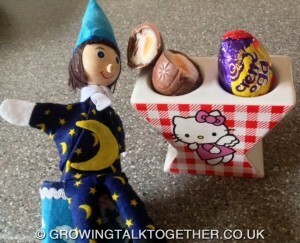 Humpty Dumpty sat on the …….! 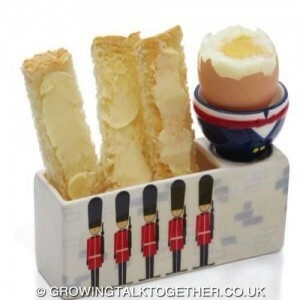 Humpty Dumpty had a great …….! 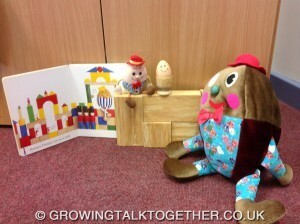 Can your children build a wall for Humpty to climb up onto? With bricks/blocks/shoe boxes? How high can it be? 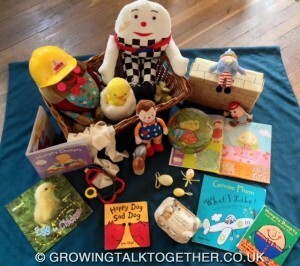 Play and chat to support understanding of what happened to Humpty? 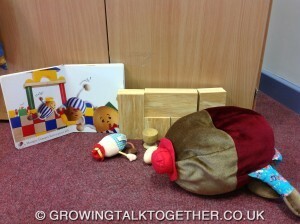 Chat about what happens to Humpty when he falls off ? Did he hurt himself 🙁 So now what should we do? We phoned the Doctor, went to hospital in an ambulance, met Miss Polly and her poorly Dolly which then lead to playing “hospitals” for many days since! All the children have shown us their plasters and wounds! After all this play the children now really understand that Humpty was hurt when he fell 🙁 As any egg would be! 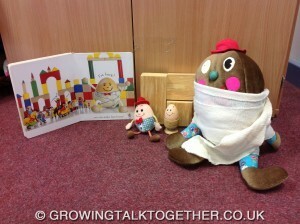 Until we chatted about Humpty many of the children had not realised he was an egg! 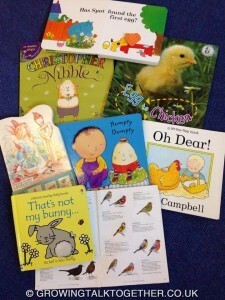 Learning & using new words– Chat about Humpty being an egg! 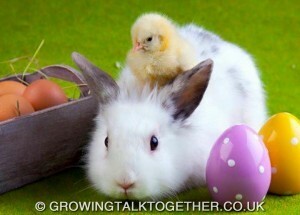 We have looked at broken eggs, noticed the yellow of the yolk, tried hard boiled eggs, dipped our “soldiers”( buttered bread) into the egg yolk and then looked at the difference between chicken eggs and Cadbury’s Cream Eggs and discussed where eggs come from, they don’t all come from the Easter Bunny Rabbit!!! 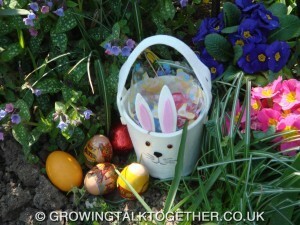 Some children will be familiar with Easter Egg Hunts, Treasure Hunts or Hide and Seek Games . 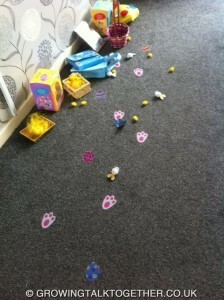 We have been having Egg Hunts inside and outside and for our older children we even had clues! 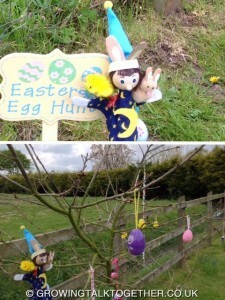 Last year we had to play Egg Hunts for many days during the Easter holidays! What a great way to understand and use all those positional words! And then after all the Egg Play share an Egg/Chick/Rabbit Related Book and enjoy all the Book Chatter all of which will provide you with some precious moments together where Talk can really Grow!! that your children have enjoyed this holiday!